Everyone has that one question they wish they had the answer to. Some have profound questions. Others have questions about extreme circumstances. Even others have questions that extend beyond current reality. But what if you could get the answers to your unanswered questions? What if you didn’t feel alone in having questions that went unanswered? 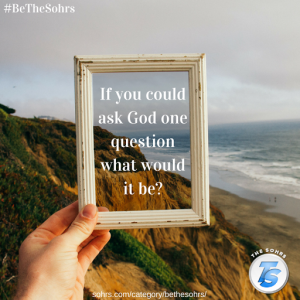 Today’s #BeTheSohrs focus is “if you could ask God one question what would it be? Where have you seen evidence of God’s presence?